Prince Aidan Gairden’s life was planned out for him 800 years before he was born. 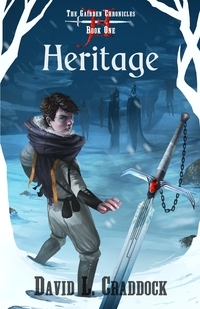 On his sixteenth birthday, he will take up Heritage, the magical sword wielded by his mother and generations of Gairden ancestors before him, and lead the kingdom of Torel into a new golden age of peace and prosperity. That’s how his mother envisions his impending reign. Aidan prefers to see it as decades of sitting in an uncomfortable chair listening to old men bicker over property lines and taxes. If Aidan had his way, he would leave the sword and throne behind for a life free of responsibility. To Aidan’s utter shock, Heritage grants his wish. In front of his parents and the entire kingdom, the sword rejects Aidan, leaving Torel without an heir. While Aidan struggles to find his place, an ancient evil awakens and provokes a war between Torel and the warrior tribes of the west. Thrust upon a bloody trail of deception and corruption, Aidan is forced to make a desperate choice: lead Torel in a war he does not believe in, or be banished from his home and family forever.